Jude and her husband Alan own and run Pucara International in Oregon. They run over 300 huacaya and suri alpacas. They also are partners in Pucara Alpaca Stud in Australia. In 1994 Jude left school teaching to concentrate fully on the breeding and animal care of alpacas at Pucara Alpaca Stud, Australia. AAA (Australia) judge since 1998, Jude gained AOBA ( U.S.) certification in 2002 and Senior Judge and judge trainer/instructor status in 2005. She also certified at the IAJS school in Peru in 2000. 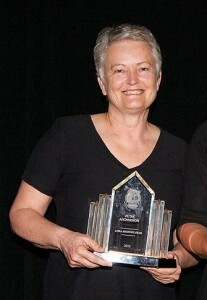 Since 1998 Jude has judged in Australia, USA, Canada, New Zealand and the UK. That included judging National shows in Australia, New Zealand and of course, the U.S.
Jude has also conducted seminars and spoken in Australia, New Zealand, Canada, USA, UK and Germany on topics including breeding, reproduction and alpaca husbandry, alpaca fiber, selection, genetics, and nutrition. Jude is a past secretary of the Australian Alpaca Co-operative Ltd and has completed a wool classing certification. She was also a past vice president of the A.A.A. Western region. For more information, visit Pucara International Alpacas. Mary-Jo was brought up in rural Northern Alberta, Canada. Worsley is a small farming community and although her parents did not farm she was always helping out on friends farms. Mary-Jo was a member of 4H Light horse and beef and rode and trained horses and showed cattle. Upon graduating from St. Francis Xavier University with a business degree in 2000 she moved to England and joined Joy Whitehead at Bozedown Alpacas and was meant to stay for 6 months to 2 years and is still here over 11 years later. As most people do she fell in love with the alpacas and found a keen interest in the breeding program at Bozedown. Mary-Jo has attended many seminars and been involved in a lot of committees helping to develop the British industry and spent two years as a board Member for the BAS. 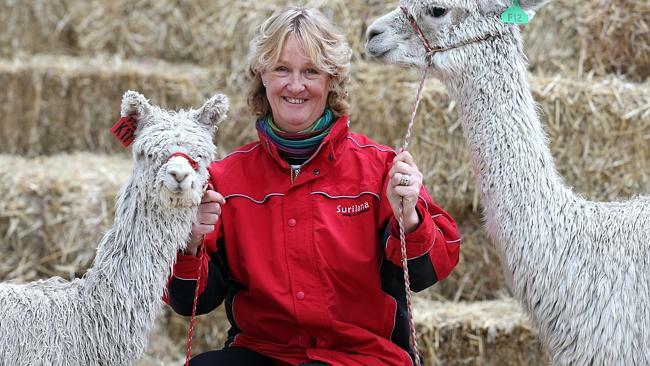 Mary-Jo has played a large role in developing the Bozedown herd, has been to Peru to select alpacas from some of the top breeders in the world along with traveling to other countries to see where the UK herd is in comparison to the rest of the world. She has had opportunity to assess thousands of alpacas in the process. Bozedown Alpacas have a large herd of both Suris and Huacayas and Mary-Jo enjoys the challenge of improving their herd each year. For more information, sign in and visit the Judges page of the British Alpaca Society or Bozedown Alpacas. Angela, together her husband Ian, run Surilana, Australia’s largest suri herd. Surilana is situated in north east Victoria. The herd comprises over 600 suris, as well as a substantial huacaya herd. 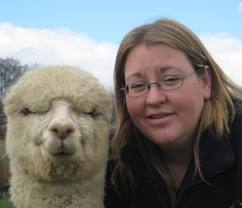 Farming alpacas, has been a full time passion for Angela and Ian for over 18 years. They are now heavily involved in quarantine and export for Australian alpacas being exported to New Zealand, Europe, the UK and Asia.Angela is a level 1 judge with the Australian Alpaca Association and has many years of experience judging large and small shows all over Australia, including the Sydney, Perth, Adelaide and Melbourne Royal Shows and the Australian National Show. She has also judged in New Zealand, Germany and Canada. Angela enjoys the experience of judging, as it allows her to see a vast range of alpacas and fleeces and to be able to meet alpaca breeders world wide. Angela enjoys sharing her passion with alpacas and has given seminars on breeding suris throughout Australia, Germany and New Zealand. She is really looking forward to judging at the BAS National Show. Having been in alpacas since 2004, Jay and his wife now run a herd of over 100 alpacas made up of both huacaya and suri, full-time. Having always had a keen interest in genetics, fibre and animal behaviour, Jay has attended many seminars and courses and has been teaching on these and other subjects over the last few years. They run a small fibre co-operative from their farm and produce mainly yarn for re-sale but also try to continually find innovative uses for the lower quality fleece. Being an advocate of the show ring, Jay firmly believes that it is a great place in which to raise awareness of the importance of careful breeding and in which to educate the public. By being a BAS judge, Jay hopes to contribute in educating and helping others and to ensure that both exhibitors and the public enjoy the showing of alpacas. For more information, sign in and visit the Judges’ Page of the BAS website, or Pure Alpacas. Tim grew up in Australia with alpacas and was involved in many facets of his family’s alpaca herd and was mainly involved in alpaca selection, breeding, showing, fibre harvesting and sales. As well as involvement with the family herd, Tim also held a position on the AAA Tasmanian Regional committee and was involved in show organisation throughout the region. In 2002 he came to England to work for one of the leading alpaca producers in the UK and undertook a herd manager’s role of approximately 170 alpacas. Two extensive trips to Peru selecting stock for export in 2003 and 2004 increased Tim’s knowledge further as he worked alongside the Tijera family (Koricancha) and Rural Alianza EPS who own 43000 alpacas. Tim qualified as a BAS judge in 2006 and has since judged alpaca shows all over the world and visited China as a selection and breeding consultant on invitation from a Chinese University and Government agency. As his own herd of alpacas grew Tim left my employment and began farming full time in 2006. Along with his wife and two children they now enjoy a herd of over 300 black and grey alpacas and the breeding challenges they present. For more information, sign in and visit the Judges’ Page of the BAS website, or Inca Alpaca.